When it comes to hiking the Hudson Valley, you’ll have your pick of places to go. With numerous state forests, state parks, and preserves, your only concern will be whether or not you have enough time to explore them all! Take a look at some of our favorite hikes below. The pastoral beauty of the Hudson Valley abounds with breathtaking hikes that wind through valleys and climb mountains to dramatic viewpoints. You can walk down paved paths at a leisurely pace or feel your heart race as you climb up huge rocks. No matter what kind of hike you seek, you won’t be disappointed. Don’t let the name scare you off, as this is one of the most popular hikes in the Hudson Valley! Do be advised, though, that it provides quite a challenge, and be sure to wear sturdy shoes because stretches of this trail can be quite steep. As you climb this trail, the views will become increasingly more spectacular, making Breakneck Ridge worth the effort. If you’re looking for a more leisurely hike, the Walkway Over the Hudson is another excellent attraction in the Hudson Valley. Enjoy incredible views of the Hudson River, the Catskills, the Hudson Highlands, and the Mid-Hudson Bridge as you stroll along. If the 3-mile trek over the Hudson doesn’t leave you satisfied, you can continue on to the Hudson Valley Rail Trail, which stretches from the Walkway Over the Hudson to Lloyd. The Mohonk Preserve is a great place to visit if you want to spend a day hiking multiple trails. 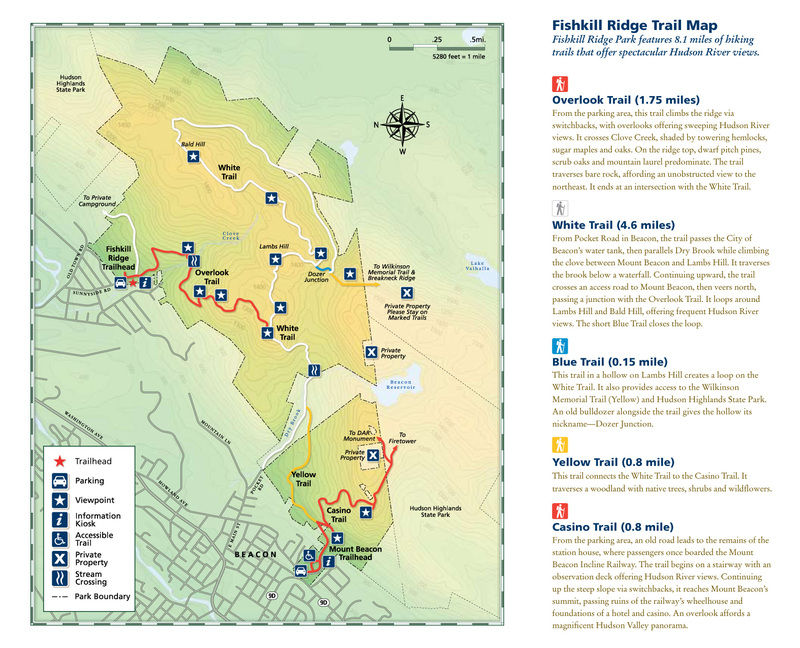 Not only does the preserve have many trails of its own (like Millbrook Mountain and the Bonticou Crag and Table Rocks), but it is also close to several other fantastic hikes. These include the Mohonk Mountain House Labyrinth and Lemon Squeeze and Stony Kill Falls hikes, and the Minnewaska State Park Preserve is also nearby. Whether you choose to stroll around the lake or ascend to expansive panoramas, you’ll find spectacular views here. Be sure to give yourself time to explore! One of the coolest hikes here, through the ice caves and to Verkeerderkill Falls, is in the Sam’s Point Area. There is always the option of cutting your hike short, but the Mount Beacon Fire Tower awaits you at the end, and the panorama at the top is worth braving the heights. The Hudson Highlands State Park Preserve covers thousands of acres, and it features plenty of trails that range from easy to challenging. Bear Mountain is a popular spot for all kinds of outdoor recreation, and hiking is certainly high on the list of things to do here. It’s also a good place to hike during the winter when some of the other trails are closed due to ice and snow. During the hike at Storm King Mountain, you’ll be treated to fantastic views at several different points in the trail, so be sure to bring your camera! Nestled in the middle of Ferncliff Forest, you’ll find a fire tower rising high. At the top, you’ll be able to look out over the Hudson Valley upon views that go on for miles. From the overlook at the Franny Reese State Park, you’ll have great views of the Mid-Hudson and Walkway Over the Hudson. Plus, along the way, you’ll get to see some cool ruins. You’ll feel like you’re discovering a mysterious secret when you pass through the cave on this hike to get to the waterfall at the end. Local Tip: Make sure to check if hikes are open, if you need any special passes, or have to pay admission before you visit. It’s also a good idea to bring along plenty of water and a snack or two if you’re going on a long hike! For an exhaustive resource on other treks in the area, check out Hike the Hudson Valley. If you’re looking for other things to do in the area, take a look at our free Vacation Guide—from restaurants to other outdoor recreation to festivals and beyond, it’s got you covered. Our romantic inn in the Hudson Valley recalls the look and feel of a 1900s Adirondack Great Camp without sacrificing any of the luxuries you would find in a modern day 5-star hotel. No matter which room you stay in, you can expect to be surrounded in comfort and elegance. Our rooms are inviting, with warm atmospheres and an abundance of natural light. In addition to touches like soft bathrobes and sumptuous linens, many of our accommodations also feature crackling fireplaces and spacious tubs. All you’ll have to do to return to the natural beauty of the Hudson Valley is step outside—Saint Hubert’s Lodge sits on 165 beautiful secluded acres. These include orchards, ponds, and nature trails, which provide you with your own private oasis. Be sure to take a look at all of our accommodations, and book your stay in the Hudson Valley today!